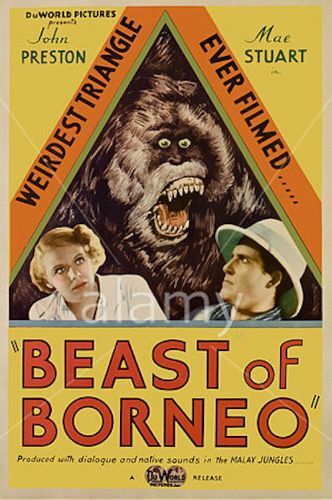 A hybrid jungle melodrama-horror show, Beast of Borneo consisted of mainly leftover footage from Universal's 1931 East of Borneo. A couple of added dialogue scenes were spliced into what was essentially a travelogue and a series of close-ups of an enraged orangutan. A noted big game hunter, Bob Ward (John Preston), is visited in the jungles of Borneo by Russian scientist Boris Borodoff (Eugene Sigaloff) and his lovely assistant Alma Thorne (Mae Stuart), who want to prove the evolutionary link between man and beast. Ward at first declines to lead the scientists to a tribe of orangutans, but Alma's charms finally convince him. Along with Ward's pet orangutan, Borneo Joe, they track the apes and actually manage to capture a male orangutan, whom Dr. Borodoff anaesthetizes with a shot of whiskey. Borodoff, it soon appears, is quite insane -- and Bob, in an effort to calm him down, is knocked unconscious and dragged into the jungle by the tormented orangutan. He is rescued by Alma and Borneo Joe, but the trio can only watch as the enraged simian kills the evil Dr. Borodoff. A cast of unknowns struggled valiantly with this ersatz Tarzan story, but they were soundly defeated by amateurish production methods. Leading man John Preston later starred in a couple of cheap Northwest melodramas for Poverty Row company Stage & Screen. Although reviewed in 1933, Beast of Borneo did not enjoy a wide release until 1944.